Barbara Cella Dinon, a resident of Villa St. Benedict in Lisle, IL and a former longtime resident of Naperville, IL, was born on November 6, 1926 in Oak Park, IL. 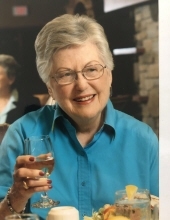 She passed away peacefully on April 1, 2019, at Villa St. Benedict. Barb is survived by her eight loving children: Catherine (Jerome), John (Diane), Paul (Jeannie), Mary, David (Kimberly), Michael (Diana), Peter (Karolyn), and Thomas (Catherine). She loved and delighted in her 24 grandchildren and 19 great grandchildren. She was preceded in death by first husband Paul (1968), and second husband Alfred (2017). Barb was a woman of many accomplishments. Although her family was always her top priority, she had an abundance of friends and an active social life, including a special, spiritually-enriching “soup group.” She was also an accomplished professional in the Chicago banking community, spearheading and mentoring countless other young professional women through her tireless efforts on the board of the National Association of Banking Women. Her charitable works span her adult life, from the Christian Family Movement in the 1960s, to the League of Women Voters in the 1970s-1980s, and more recently, Naperville Cares, a local charity that provided programs in support of low-income families. Loaves and Fishes, the organization that acquired Naperville Cares, honored Barb and her husband Al with its First Annual Lifetime Achievement Award in 2016. A widow at age 41, Barbara raised 8 children, ages 17 down to 5 at the time of her husband’s death. Her positive, forward looking spirit instilled a “can do” attitude in all of her children. She lived a life of generosity, always doing what she could to help those around her. Barbara touched the lives of all she knew in big and small ways. While she will be missed terribly, she truly lives on in the lives of her children and grandchildren. For those who would like to leave a lasting tribute to Barb’s life, memorial donations may be made to Loaves and Fishes Community Services (www.loaves-fishes.org), or Villa St. Benedict (www.villastben.org). A Memorial Visitation will be held on Thursday, April 4, 4:00-8:00 PM at the Friedrich-Jones Funeral Home & Cremation Services, 44 S. Mill St., Naperville. The Memorial Mass of Christian Burial will be celebrated on Friday, April 5, 10:30 AM at St. Raphael Catholic Church, 1215 Modaff Rd., Naperville. Inurnment will be at St. Mary Cemetery, Evergreen Park, IL. To send flowers or a remembrance gift to the family of Barbara Cella Dinon, please visit our Tribute Store. "Email Address" would like to share the life celebration of Barbara Cella Dinon. Click on the "link" to go to share a favorite memory or leave a condolence message for the family.